For the past several weeks, my pace has been faster and more relentless than I would have chosen. Lots of good things going on — shows, family here for Thanksgiving, the needs of an increasingly incapacitated husband, and spending time at the looms to Make Stuff. With the exception of one more gig on the 17th — a local (Freeland area) artists’ open studio day — my public events are over with. And a good thing too, as I’ve had enough, and am tired of being ON while longing for long stretches of quiet attentive time at my work. Lots of new ideas beginning to swarm in my mind, and several commissions to work on during the winter. 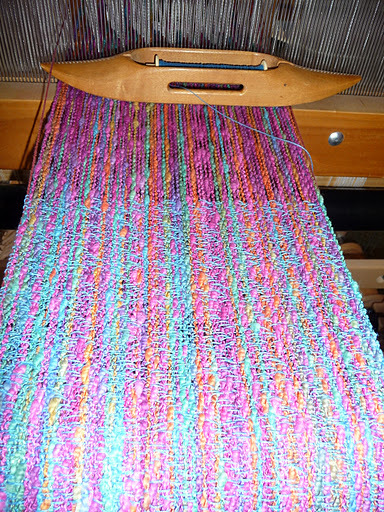 Above are some shots of work on the “Hot Stuff” series — first, the seven yards on the warping board (three scarves worth), then the width of the warp as it came off the warp beam at the back of the loom, and finally a portion of #1 in the series in process, woven with a turquoise bamboo. 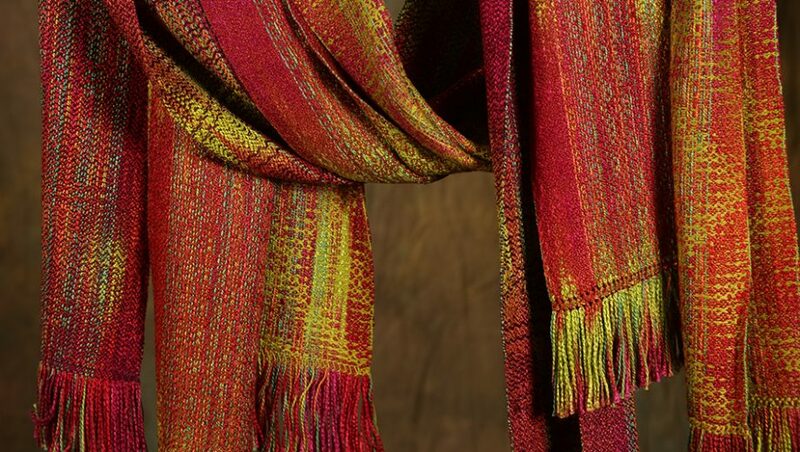 #2 was woven with a red-purple tencel, and #3 with a dusty orange tencel. They were snapped up at the Anne X 2 studio sale on Thanksgiving weekend. 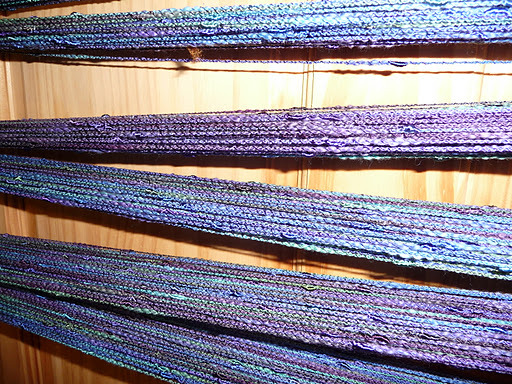 Above is “Summer Nights” on the warping board; again seven yards, enough for three scarves. 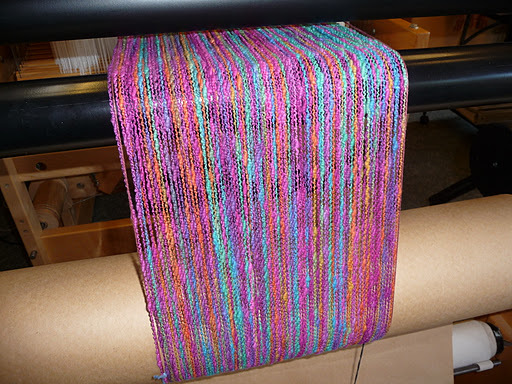 And just below is the same warp, up close and personal so as to see the lovely bumpies in the yarn. 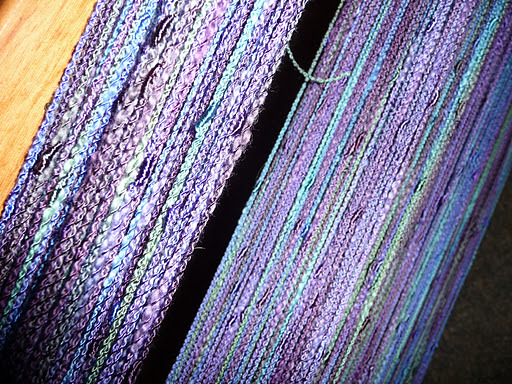 Summer Nights coming off the warp beam, under tension, all threaded with tension adjusted and ready to weave up front. 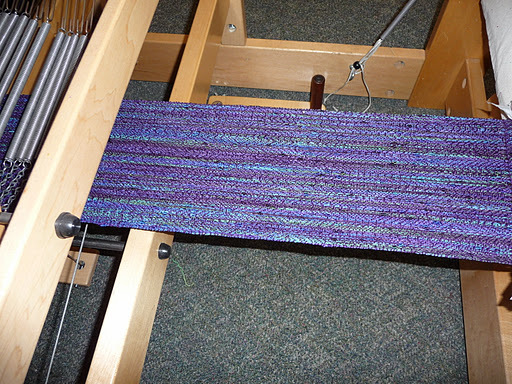 Below is the first scarf as it wends its way toward the cloth beam. 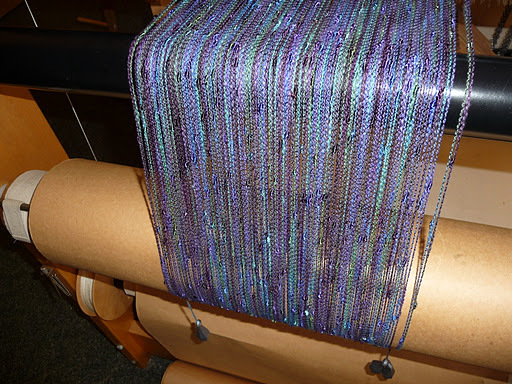 The warp is a hand-dyed rayon/cotton with wonderful slubs; the weft for this first piece is a deep purple pearl cotton. 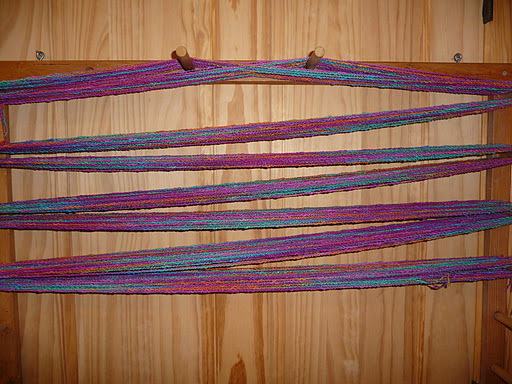 The second scarf in the series is begun, but no photos taken yet. That’ll be tomorrow, I think, and yes I promise to share. Right now I’m going to go play with some new patterns I’ve been developing in my mind, see if I can make them work in the design software.